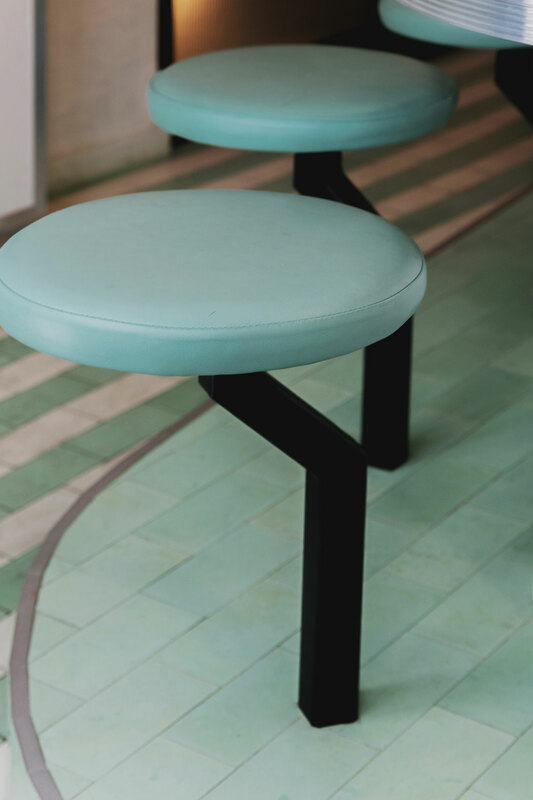 Photo by Mariell Lind Hansen. 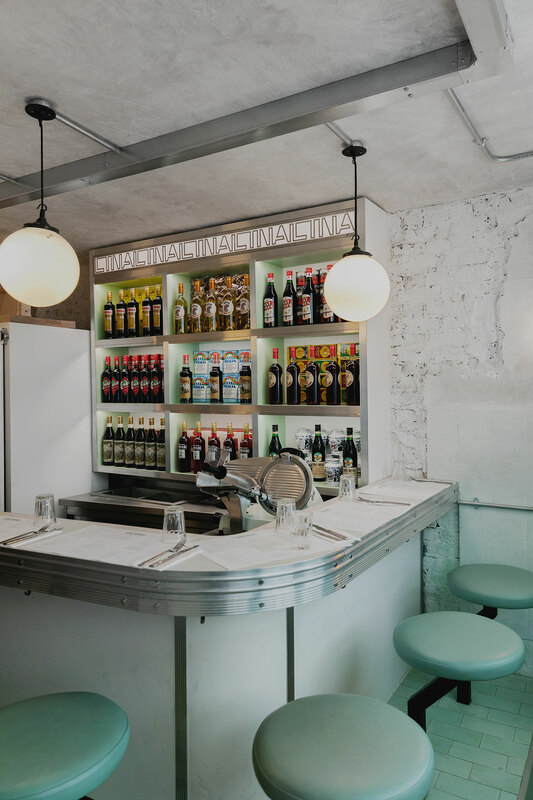 For Londoners, the Italian delicatessen Lina Stores on Brewer Street is a Soho institution. 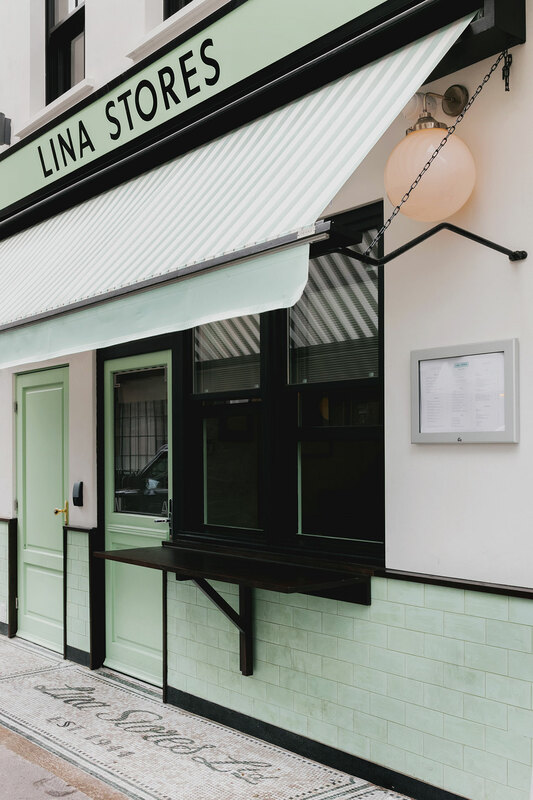 Having served authentic Italian produce including fresh pasta and sandwiches for the past 75 years, the opening of the new Lina Stores restaurant a few blocks away is sure to delight locals and visitors alike. 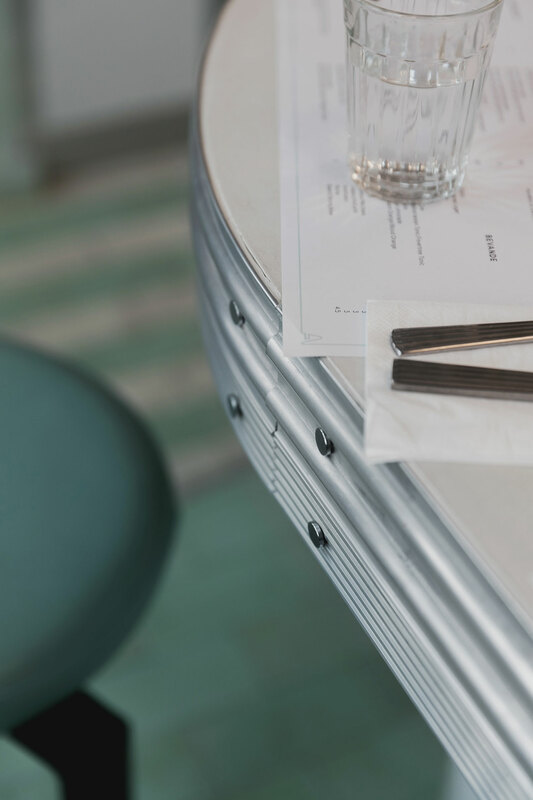 Designed by London-based architectural practice Red Deer in close collaboration with its owners, the new venue eschews the traditional aesthetic of an Italian trattoria for a unique sensibility that draws from the pistachio-green and white palette of the iconic Brewer Street deli, the sleek modernism of mid-century dinners, and the neighbourhood’s urban vibe in order to create a nostalgic yet contemporary dining experience. 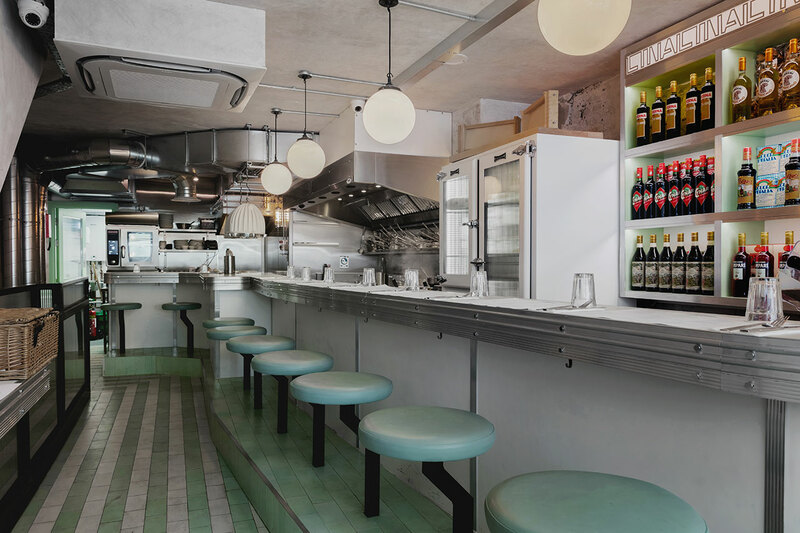 The 53-seat restaurant, which occupies two floors on 51 Greek Street, features a dining counter seating 12 on the ground floor and a more traditional dining arrangement on the basement level. 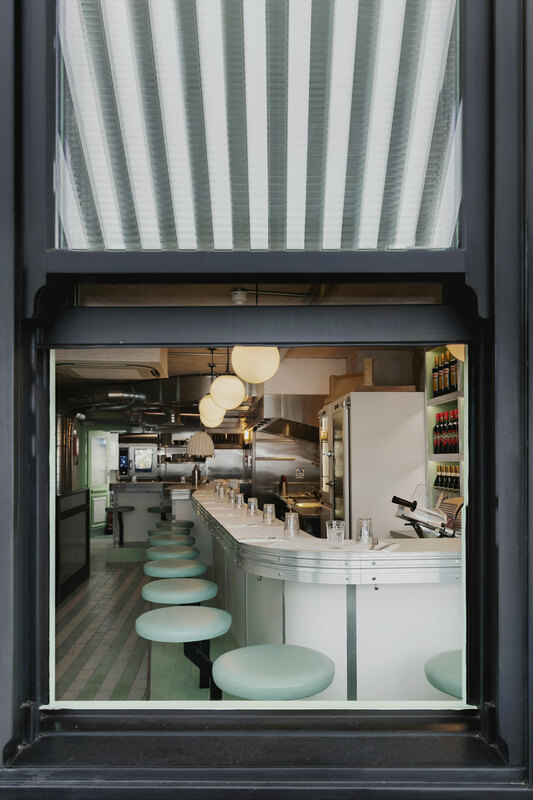 The architects’ main challenge was to pay tribute to the unique aesthetic of the iconic deli without however imitating it which they have thoughtfully accomplished by reinterpreting the stylistic features of the original Lina Stores through a contemporary design language. 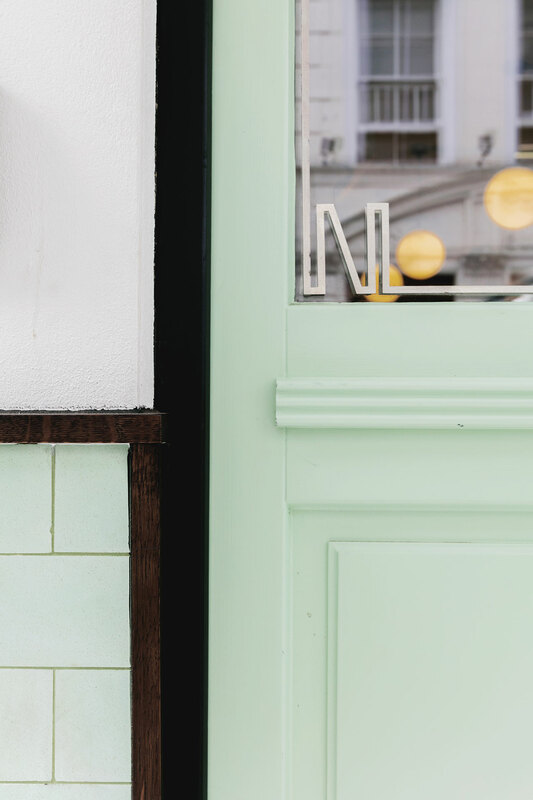 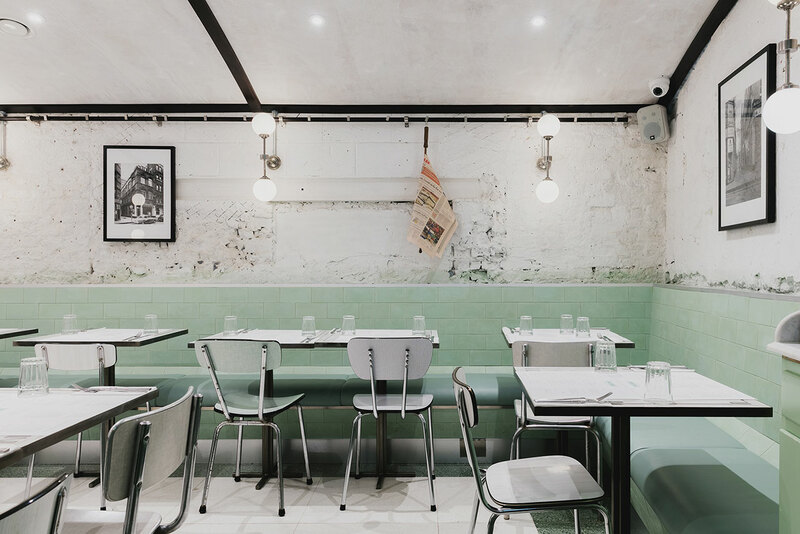 The most characteristic element of the original Lina Stores is undoubtedly the pistachio-green colour found in the ceramic tiling and wooden shelving, among other features. 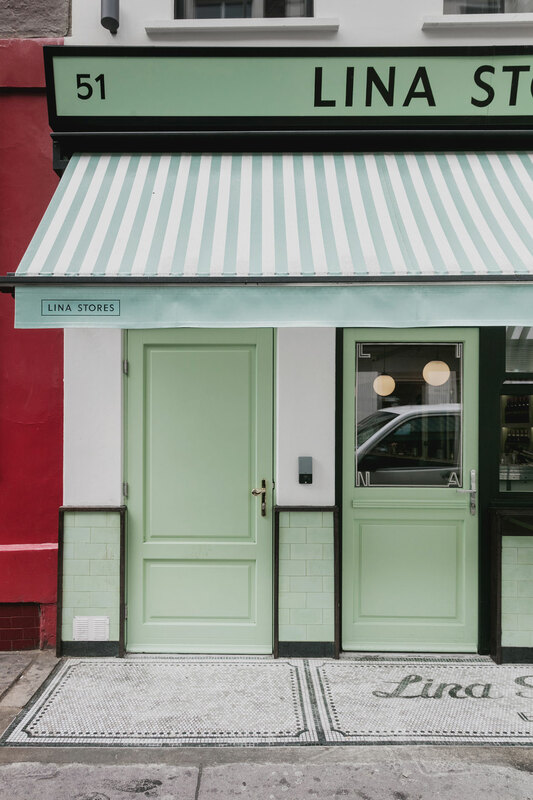 For the new restaurant, the architects used it on leather upholstery, timber doors, and concrete tiles for walls and flooring, the latter inspired by the emblematic striped pattern found on the store’s shopping bags which can also be seen on the awning adorning the restaurant’s façade. 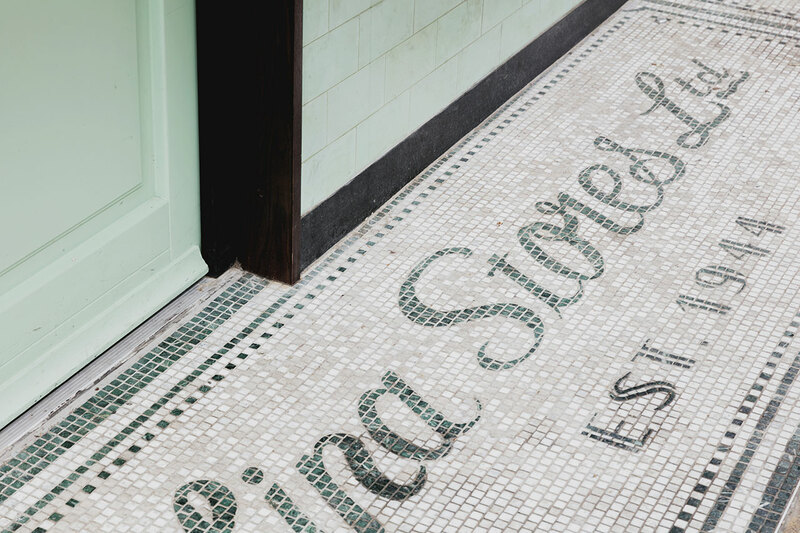 The venue's exterior also includes an intimate 4-seat exterior bar counter, a traditionally inspired mosaic floor, and a hand-painted signage inspired by European Art Deco cafés. 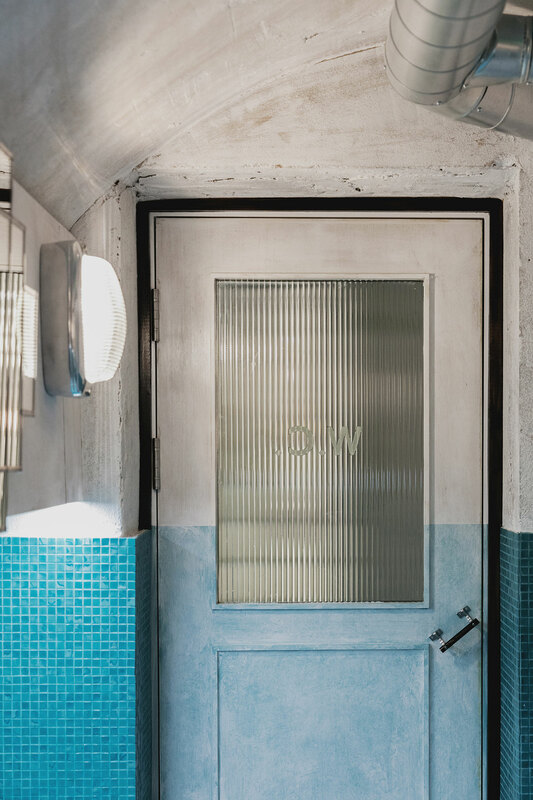 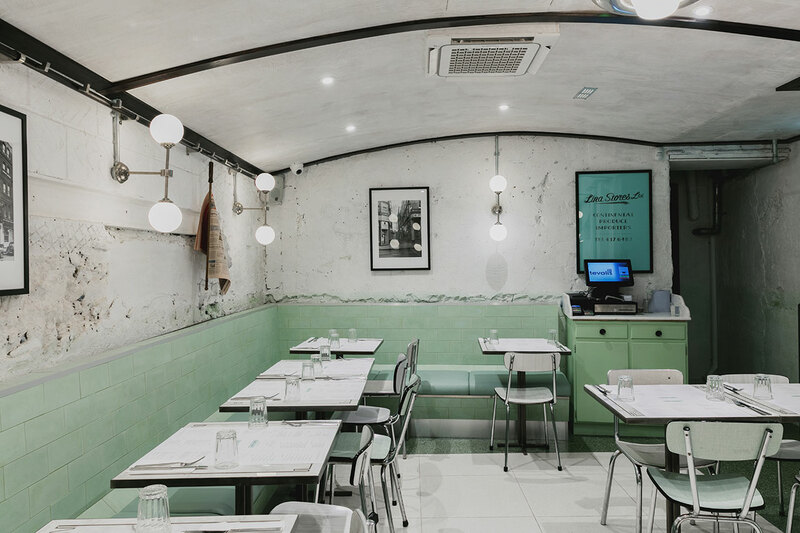 The nostalgic sensibility continues inside where a Formica bar counter, which features fluted aluminium detailing, leather bar stools and reclaimed globe lighting, channels the mid-century sleekness of a diner. 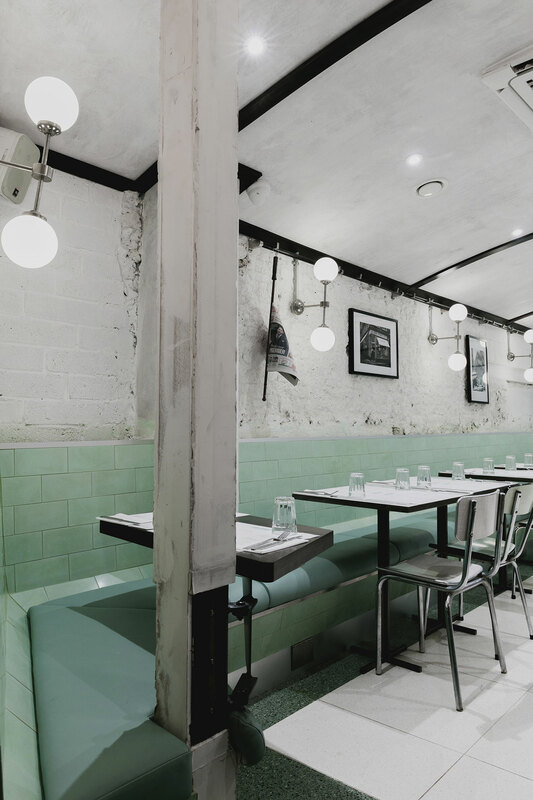 The stylized aesthetic of the dining counter stands in contrast to the exposed concrete and brickwork surfaces surrounding it, part of the building fabric that the architects purposefully reclaimed, and which along with the visible piping and ventilation equipment imbue the restaurant with raw authenticity. 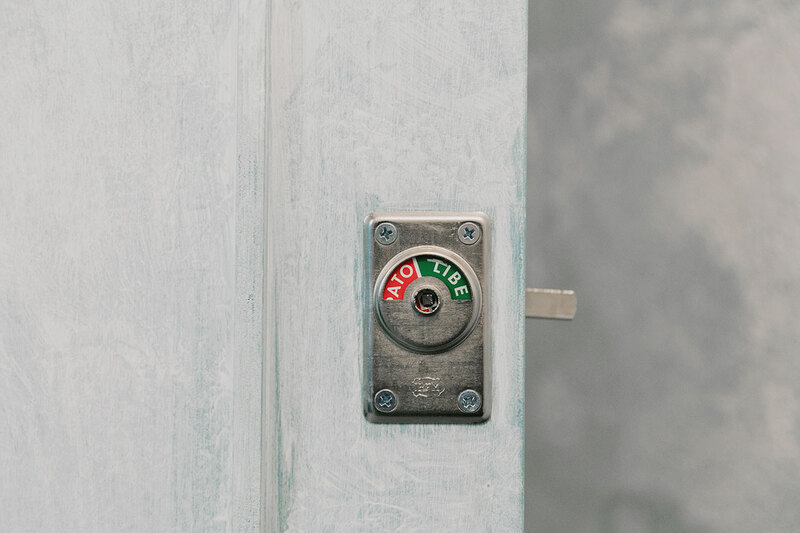 As Red Deer’s co-founder Real de Azúa explains, “re-use is of great importance to us. 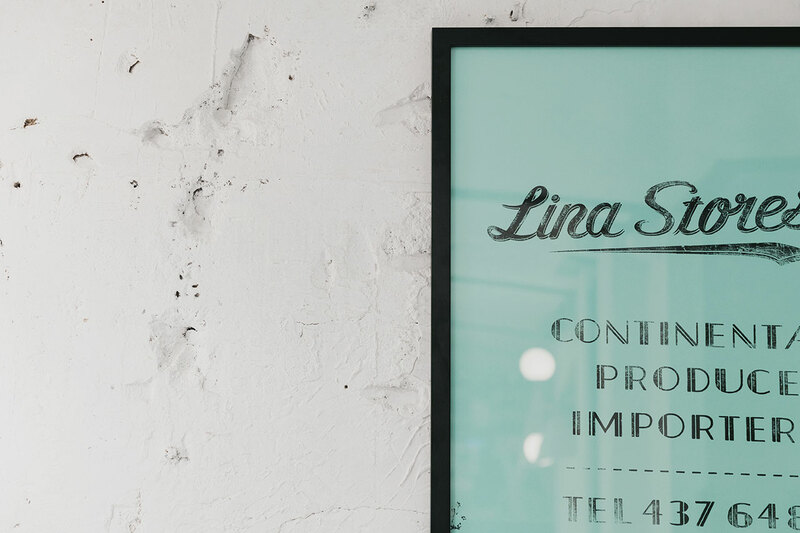 For the design of Lina Stores, 51 Greek Street, we reclaimed where we could and played with the innovative repurposing of materials”, which indeed they have, judging from the unique plaster they developed using - among other things - leftover ground coffee beans from the Lina Stores deli. 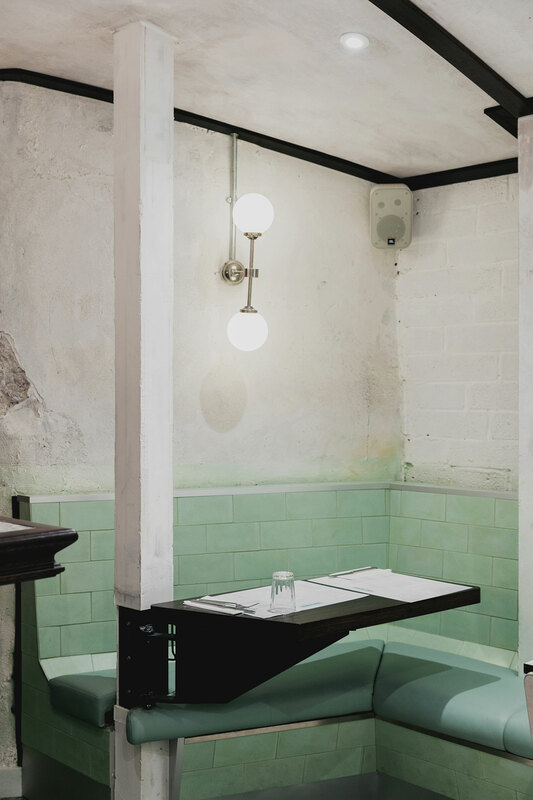 The juxtaposition between vintage elegance and industrial roughness continues on the basement level where two tone plaster and exposed brickwork are complemented by green and white terrazzo flooring, tiled green banquettes with leather seat pads, and a traditional rich timber 4-seat aperitif and cocktail bar that looks like it was plucked right out of an old Roman Caffè. 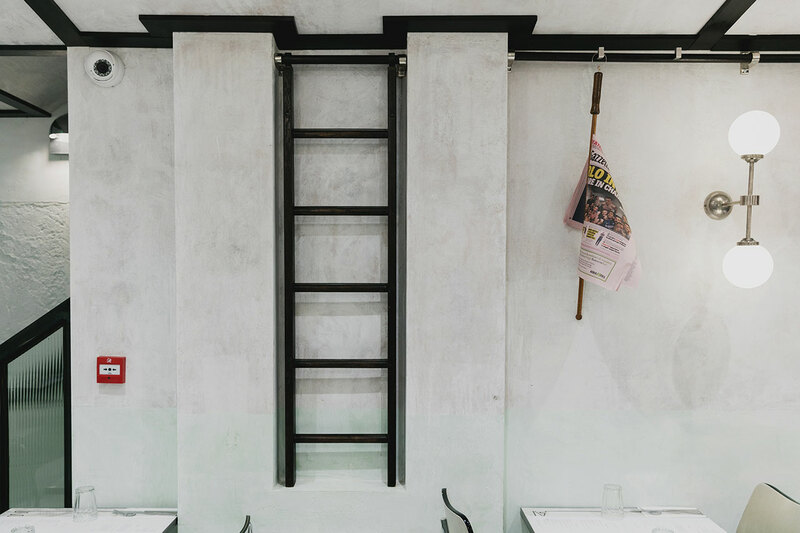 Special attention has also been paid to the dining tables which have been custom made in collaboration with graphic designers EverythingInBetween out of Carrara marble and aluminium, and stylishly paired with reclaimed Formica dining chairs. 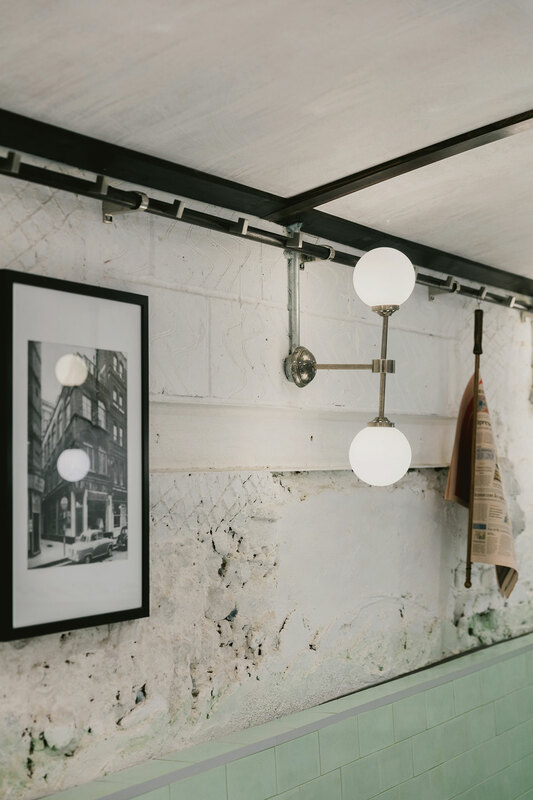 The décor of the space is further animated by an eclectic selection of paraphernalia including traditional espresso makers, newspaper racks, vintage photography and potted plants, while the vaulted ceiling makes for a more intimate ambience that is sure to impress patrons as much as the authentic Italian cuisine on offer.